Celebrities and social media influencers have been all over news platforms for their bloody snaps of the Vampire Facial. Yes, this facial treatment leaves your face splattered with blood — but all is well in the name of anti-aging, youthful glowing skin! Learn all about this haunting facial and it’s anti-aging benefits! The Vampire Facial, also referred to as platelet rich plasma therapy (PRP), uses your own blood and platelets to rejuvenate your complexion by re-injecting them back into your face for enhanced healing. This type of therapy has been used in the treatment of many sports related injuries such as sprained knees and tendon injuries because it stimulates elastin and collagen growth, which kicks tissue healing into overdrive. This method has now transitioned from orthopaedic injuries to an anti-aging facial procedure. 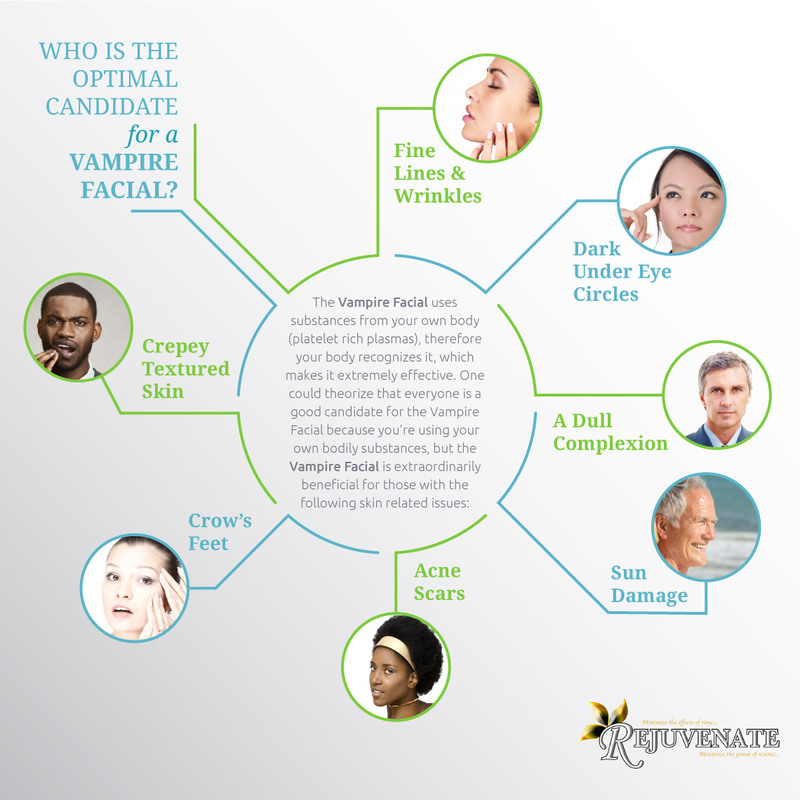 The Vampire Facial is effective in treating skin related issues such as sun damage and wrinkles because it induces direct trauma to the skin through an electric microneedler. The microneedler applies tiny puncture wounds to the skin’s surface causing the body to rush and repair the damage. The the platelet rich plasma in injected into the skin to further stimulate collagen productions. The plasma will speed up recovery time to the microscopic wounds, leaving the skin refreshed. What does the Vampire Facial entail? The Vampire Facial is a non-invasive procedure that will have you in and out of your clinic within an afternoon. Below is what you’ll experience with a Vampire Facial procedure. You’ll begin your journey with a numbing agent applied topically to your face, usually as lidocaine and tetracaine. The anesthetics take about a thirty minutes to numb your entire face. The numbing creams are optional, but it is suggested that you get it. This is the part where you get your blood drawn. It’s a traditional blood draw and you’ll sit in a chair while a nurse draws a tube or vial of your blood. The blood contains the platelet rich plasma that later heals and treats your skin. Your tube of blood that was just drawn is then taken to the lab, and spun and separated in the centrifuge. The microneedling process is performed by an aesthetician or medical professional that applies a device with tiny needles to create small puncture wounds, as they simultaneously apply the PRP to penetrate the wounds. The microneedling takes about 20 minutes total, and it’s completely normal for your face to bleed during the course. Following your Vampire facial expect your face to be very red and a bit swollen, and avoid using makeup for 24 to 36 hours afterwards. Complete healing takes about a week where your skin is no longer red or spotty, and as your facial tissue regenerates your face will glow! If the Vampire Facial sounds enticing and you want glowing,m refreshed skin, schedule an appointment with us today!